Feeling his water bill is too high, homeowner Terry Haynes decided to dig a well in his backyard Tuesday. If you think you're paying too much for Town of Woodbury water service, Terry Haynes has an idea you might want to try. 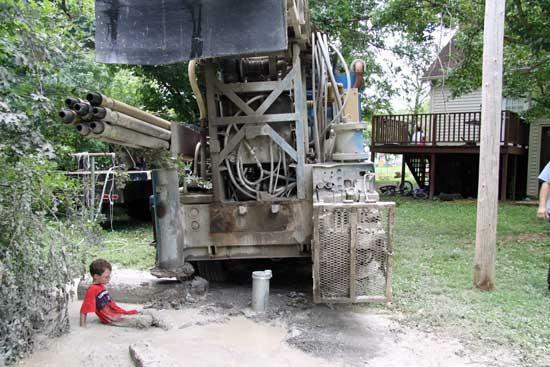 Dig a well in your back yard. That's what Haynes did Tuesday morning at his home on Mason St.
"I think it is a good idea for everyone to do because the water is so good in Cannon County," Haynes, the owner of Terry's Plumbing, said. Haynes said his water bills have been averaging about $100 per month. About half of that is for sewer service. The well is 125 feet deep and generates 50 gallons of water per minute. Haynes said he received a permit from the State of Tennessee Department of Environment and Conservation to dig the well. It is believed to be the only active well within the Town of Woodbury limits. "It (the water) has the sweetest taste to it, pure, no odor," Haynes said. "People are sick and tired of paying these high water bills, and digging a well is one way of doing something about it," Haynes said. it would have been cheaper just to put in a septic tank... and it would have reduced your bill..
You will still pay monthly just for having a tap! I WISH I HAD CITY WATER. A LOT OF US WITH WELLS ARE HAVING AND HAVE BEEN HAVING A ROUGH TIME. I WOULD GLADLY PAY FOR WATER TO INSURE I HAD IT ON A REGULARLY BASIS.